There is a bumper stick that says "Stuff Happens." Okay, so that's the polite version. In my world "Jace Happens." I've had to work on my perception of this child. I had a dear friend advise me not to label him. I had another dear friend ask me where I've been. So, this morning was the perfect opportunity to show the world what I feel like I do with most of my time, and why it is actually work not to label him... 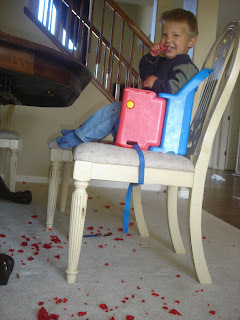 While I was spending time with Rana and Owen, Jace decided it would be entertaining to throw jello across the dining room and on to our very light-colored carpet. It was one of those moments when you're so angry that you can't discipline or parent because you will hurt the child. 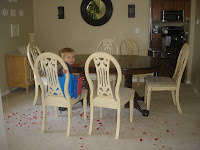 I sent him to his room, and cleaned up his mess. This is what I do, April!!! I don't even keep jello in the house, but my Mom is in town, and she made it for my sister. I don't know that I'll ever look back at this one and laugh. I see messes often and think, "Jace Happened." This one is a close second on the "Jace Happens" list behind pooping in the carpet and smearing it in. It's happened a few times. But, he is a blessing from God, right??? sounds like you have a little scotty, from what i have heard. Lilly just paints our kitchen with ravioli sauce. it was like splatter paint. Andrew threw up last week, apparently he ate too many black berries! I'm still trying to get the, now pink, color out of the carpet! Got to love our kiddos!! ok, i looked at the pics again and i'm lovin' jace's face! i believe he is laughing AT you!! He probably is laughing at me. I had already cleaned up half of the dining room when I decided to take pics. That's why the other half of the room is clean. It was EVERYWHERE -- GRRRRRR!! April, it makes much more sense for you to bring your sweet girls to me this summer. We can catch up without sweating to death!!! I'll come to you in the fall! I scrubbed every inch of it out. It would have been worth it to replace it though. I have 5 mintues until time to pick up Rana. I don't normally comment on comments, but I'm kinda having fun! Becky, hush your mouth. I don't need anymore little Scotty's running around here! I LOVE it!!!! I wish I had an "instance" that I could share....or do I??? I'm loving my life without kids, but certainly look forward to the day that I can figure out how to be the best mom, when something goes "kids", to the cutest kids, and still have all my hair...just like my big sis!! I love you girl!!!! Yes you're right, I should. How long does it take to drive there? 16 hours. Should I put you on the calendar? The last week in July is the only week that's booked so far. Mandy, thanks for making me feel normal! 16 hours??? What is a halfway point? I'm booked the last week in July too. You will laugh. Sometime in the veeerrry distant future. Ugh. He is SO cute! I'm with April- what were you thinking when you bought a house with carpet- especially in the dining room?? It's not Jace's fault at all- he's just a little kid- he depends on his mom to make smart choices for flooring. Word of advice- rip out all of the carpet in the house- it only gets worse! You have NO idea what builds up in that carpet with three kids and multiple years later (YIKES). Don't you just love motherhood? That's why we have CONCRETE floors! Abby is the same way! 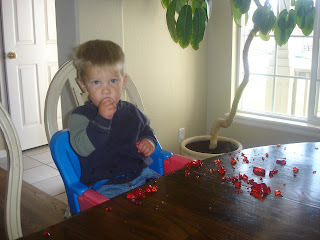 SO now I'm not afraid of red jello or even grape juice (without a sippy)~ Yep, I'm with Jen, it's all your fault choosing white carpet in the dining room. Rmember when the kids are this young, we cannot have 'style' at all in the home :)! April-maybe we can rode trip together!~ I'd love to do some catching up with both of you.